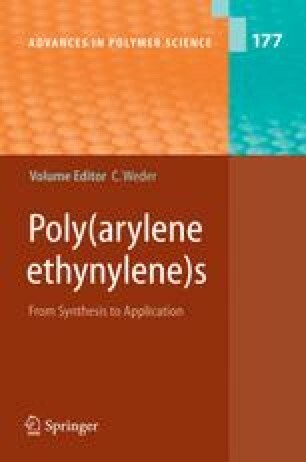 Poly(arylene ethynylene)s (PAEs) represent an important family of conjugated polymers with interesting optical and electronic properties. A great deal of attention has been devoted to the synthesis, physicochemical characteristics, and optical properties of these materials, but their electrically (semi)conducting nature has received comparably little attention. Only during the last decade have significant research efforts been devoted to this subject in research laboratories around the world, and PAEs have eventually established themselves as a versatile class of polymeric semiconductors. Focusing on the subjects of electrical conductivity, charge transport, and electroluminescence, this review article attempts to provide a comprehensive summary of the electronic properties of PAEs and their potential applications in “plastic electronic” devices.